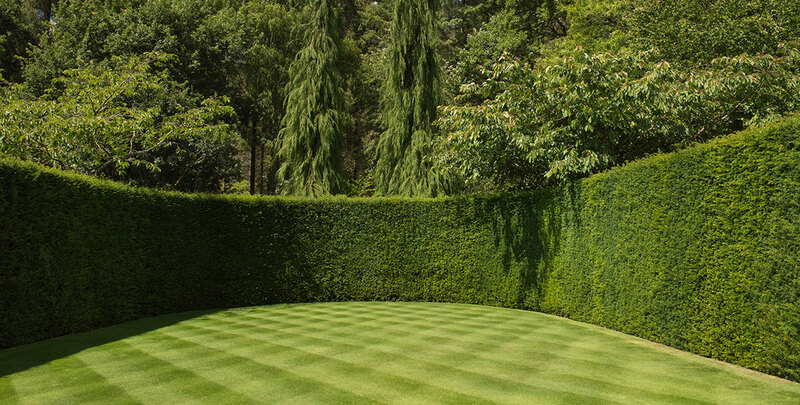 Yew hedging is perhaps one of the most classic and traditional types of hedging available. It is the only coniferous evergreen hedging plant native to Europe. 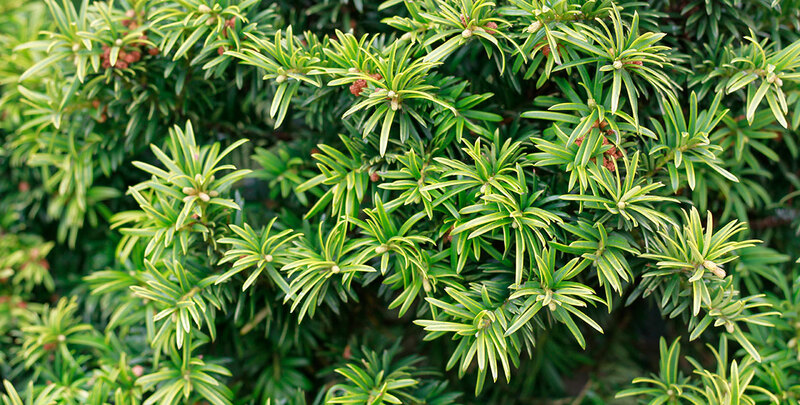 The yew has deep green, needle-shaped leaves and a compact, dense growth habit, which makes it ideal for hedging. In addition, mature yews require very little maintenance and are very resilient to pruning. Some experts even claim that the yew is the most resilient of all evergreens. Therefore, it is hardly surprising that the yew has become one of the most popular hedge plants in the world. People all over the planet have discovered that the yew possesses a number of properties that make them very suitable for hedging and topiary purposes. The taxus baccata or common yew (also known as English Yew) is likely the most popular species of yew, possibly even the most popular species of conifer, and has been so for a long time. Hundreds of churchyards in the UK contain yews that are older than the actual church buildings. It has been suggested that this may be the case due to the yew’s reputation as a symbol of immortality, which in itself is likely a reference to the long lifespan of these plants. Throughout Europe, specimens have been discovered that are believed to be over a thousand years old. Though those are exceptional lifespans, a common yew will reach an age of 400 to 600 years if maintained properly. The presence of yews in Europe and the UK dates back to the last glacial period. This makes the yew unique among evergreen hedging plants, since most of the evergreens did not appear on European soil until there was a warmer climate in these regions. Therefore, for centuries the yew was one of very few plants in this part of the world that remained green throughout the entire year. This is likely where the plant got its reputation as a symbol of everlasting life, since it generally outlives humans by quite a margin. In addition, yews have the ability to split under the weight of its growth without being susceptible to diseases, like a majority of trees does. However, there is also a dark side to the reputation of the yew. It was often seen as an omen of doom. This may be a reference to the high toxicity of the plant. The red berries that yew hedges produce are highly sought after by birds, but its seeds are very poisonous to humans and livestock. This is something to consider if you plan on planting a yew hedge in an area where cattle graze or curious pets wander around. The berry itself tastes sweet and is harmless, but its seeds, as well as a yew’s leaves and bark, contain a cocktail of alkaloids so toxic, that it is known to kill cattle and horses, that are frequently found dead near yew trees. The springy, reddish brown wood of a yew is traditionally used to produce bows. 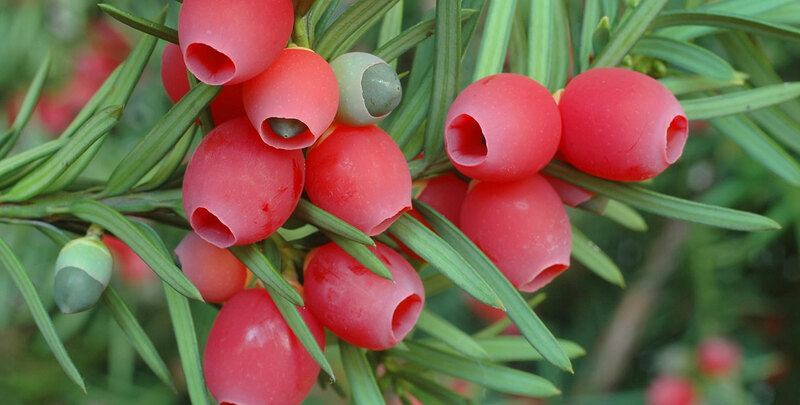 Its scientific name “taxus” refers to this, because it is derived from the ancient Greek word for “bow”. In Norse mythology, the god of archery is even called Ýdalir, which literally translates to “yew dales”. The ice mummy Ötzi, discovered in the Italian Alps in the early nineties, was carrying an unfinished yew bow. However, the legacy of the yew is not limited to the use of its wood and the symbolism concerning its longevity. The plant is also used as a raw material to produce medication for treating certain forms of ovarian and breast cancer. Unlike many other hedging species, the common yew will feel at home in a wide range of soils, including alkaline. It does share an intolerance of waterlogged soils with most other conifers. The species is very hardy and tolerant of shade and full sun. In contrast to some other conifers, such as the Lawson and Leyland cypresses, yew hedges allow for rigorous pruning, as they are very resilient and will grow back from old wood. Due to these properties, yew trees make excellent formal, small border hedges and are an ideal specimen for topiary. 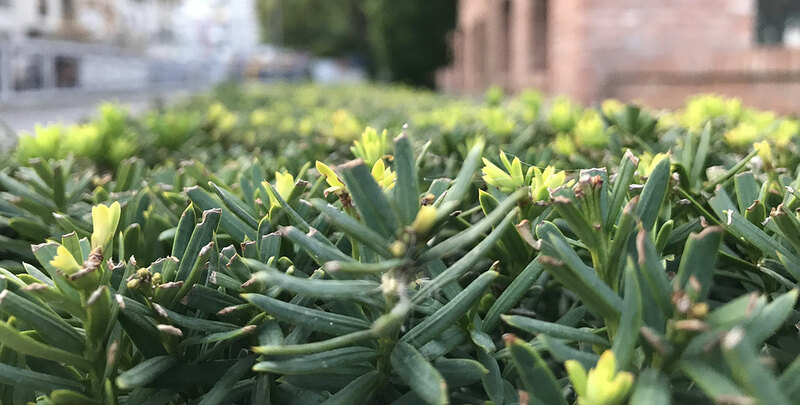 Besides, a yew hedge will guarantee your privacy, because not even the most curious of eyes will not be able to peer through its dense growth. The yew is often considered to be relatively slow growing. This is not entirely true, as young plants can grow up to 30 to 35 centimetres per year and may therefore need clipping twice a year during the first three years. Once they are established however, their growth will slow down, which allows you to clip them only once a year for the rest of their lives, preferably in the summer or early autumn. Like all other conifers, yew plants should be given enough water for the first years after they are planted. Mature hedges require little maintenance and will do well without watering. But watering is recommended in dry periods during growth season. All in all, a mature yew is a genuine low-maintenance plant. Yew hedges are extremely popular all throughout Europe and it is not hard to understand why. If the little maintenance that they require is done properly, these hedge plants will provide you and your garden privacy and elegance for a lifetime. Taxus baccata is the basic variety most people are looking for, but we also have some interesting hybrids available, such as the taxus x media ‘Hicksii’ and the taxus x media ‘Hillii’, a respectively female and male cultivar of a hybrid that grows more compactly than the classic baccata.